A great way to get the back end of your truck or SUV out of that buggy stance is to use lowering shackles and hangers. MaxTrac lowering shackles & hangers offer a simple solution to get those extra inches needed for a more leveled or custom appearance. 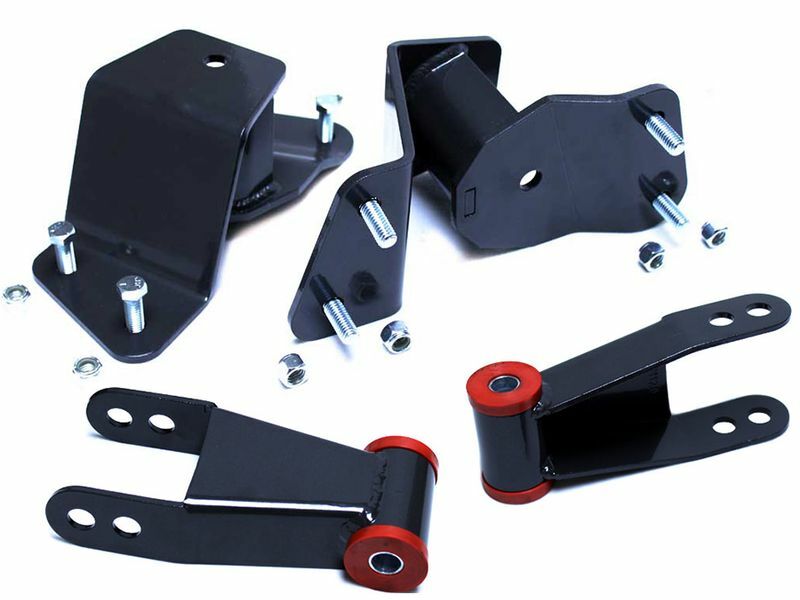 These shackles & hangers from MaxTrac are constructed of solid steel and are powdercoated to ensure long-lasting performance. The shackles include urethane bushings and zerk fittings so they may be greased for maximum durability. MaxTrac lowering shackles & hangers are better quality than your factory parts and they can be installed in about an hour. Start with leaf spring shackles for a mild rear drop. If you want to go lower, hangers are available for most applications to compliment your lowering shackles and deliver more drop! Give yourself up to 6" of drop in the back end of your ride and keep your factory ride since your OE leaf springs are retained. Plus they come backed by a limited lifetime warranty from MaxTrac. Order yours today! Since MaxTrac suspension components are designed to replace or enhance your existing suspension, there is no cutting or other modifications required to ensure a proper fit. You could install your own suspension, although we do recommend having a professional installation. MaxTrac recommends having your alignment checked after installing new suspension and adjusting your headlights if you have altered your ride height.